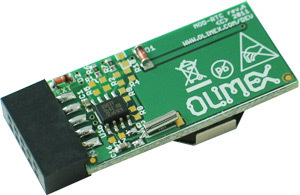 MOD-RTC is a low cost OSHW Real time clock board with a UEXT connector. The time keeping accuracy is tuned to ±1Hz on the 32768 oscillator which gives a time drift of approx 2.5 seconds per day if held at a constant temperature. If your ambient temperature varies, this time drift may be bigger.